Three to four million cats are surrendered to shelters every year in the United States alone, which means that an enormous number of cats are euthanized or live out their lives in cages. Black cats are more likely to be among the unlucky ones. Various animal rescue organizations have noted that black cats are at a significant disadvantage when it comes to adoption. A 2002 California study found that black cats were only half as likely to find loving homes as tabbies, and two-thirds less likely to be adopted than cats with white fur. Given that overall adoption rates were just 20% for all shelter cats, black cats have particularly bleak odds. 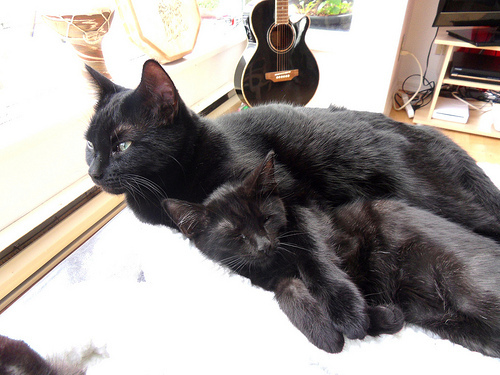 The primary reason that many adopters avoid black cats (and black dogs as well) is thought to be superstition. Black cats, and to a lesser extent black dogs, were once associated with witchcraft, and in Western cultures, they became associated with bad luck as well (though a black cat crossing one’s path was considered good luck in England). In the past, black cats have been portrayed negatively in literary works and suffered from prejudice and ignorance, so many attribute their low adoption rate to this lasting stigma. However, it has also been speculated that with their dark coats, black cats may fade into the background in their shelter cages or not be as noticeable in photographs, and thus be less likely to attract attention than their more colourful counterparts. While many experts assert that fur colour has no effect on personality, in Animals Make Us Human, author Temple Grandin notes that a number of studies have found that black cats are more likely to be laid back and friendly than those of other coat colours studied. Of course, this won’t apply to all cats. Feline personalities are variable, and life experience also plays a role. But it’s worth noting that no study has ever found black cats to have more negative traits than those of other coat colours. Grandin, Temple. (2009). Animals Make Us Human. Houghton Mifflin Harcourt. It’s All About the Cats, Inc. (2009). “Top 10 Reasons to Adopt a Black Cat.” ItsAboutCats.rescuegroups.org. Muhlhausen, Emily. (28 April 2008). “Black Cats Unlucky at Shelters.” The Seattle Times. Excellent article! I’ve always found black cats to be beautiful, and they make wonderful, loving pets. I think positive portrayals in literature help to change old perceptions. So I write about black kitties, as well as how to brighten up their photos, whenever I can.